Your bird will keep the beat by jingling and jangling the 5 nickel plated bells on this virtually indestructible toy. Bird toy contains 5 nickel plated bells, 12 marbella beads and an acrylic rod. Toy Measures 5 1/2" long and 5" wide. Ring My Bell Bird Toy5Levi and CosetteSeptember 7, 2015We love shiny bells, and there are SO many of them on this toy!! We can sit on it like a swing, we can run under the bells, and when we need for mommy to pay attention we can give it a good shake!! 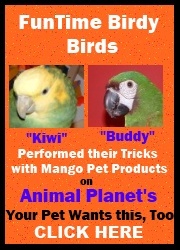 We know it's recommended for 'tiels, conures, quakers and such, but we are two budgies and we LOVE this toy!!! Ring My Bell Bird Toy5DaliNovember 10, 2014I love to yell at this toy and shake the bells really hard. Its cool that I can slide the bells back and forth and spin the beads too! Ring My Bell Bird Toy4Rachel HMay 2, 2014My conure loves this toy. It's so fun watching him ring the bells with his foot or give it a good swing with his beak. Ring My Bell Bird Toy5KimDecember 26, 2012Our bird loves the bells. She will ring them all day long. Ring My Bell Bird Toy5Lisa WardJune 2, 2012Our Conure, Buddy loves this toy. It's colorful, well built and he moves the bells back and forth like "wildly" like he is Einstein doing math equations. Great toy at very reasonable price.